Strawberry Blonde's Market Summary: "A Visit From St. Nicholas"
The poem, "arguably the best-known verses ever written by an American", was first published anonymously in the Troy, New York, Sentinel on December 23, 1823, and was reprinted frequently thereafter with no name attached. Moore later acknowledged authorship and the poem was included in an 1844 anthology of his works at the insistence of his children, for whom he wrote it. A Visit from St. Nicholas is largely responsible for the conception of Santa Claus from the mid-nineteenth century to today, including his physical appearance, the night of his visit, his mode of transportation, the number and names of his reindeer, and the tradition that he brings toys to children. 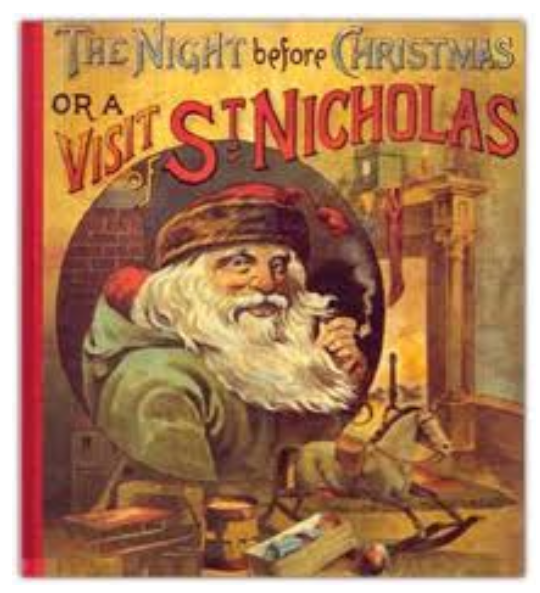 Prior to the poem, American ideas about St. Nicholas and other Christmastide visitors varied considerably. The poem has influenced ideas about St. Nicholas and Santa Claus beyond the United States to the rest of the English-speaking world and beyond. Since 1911 the Church of the Intercession in Manhattan has held a service that includes the reading of the poem followed by a procession to the tomb of Clement Clarke Moore at Trinity Cemetery the Sunday before Christmas. Moore's connection with the poem has been questioned by Professor Donald Foster, an expert on textual content analysis, who used external and internal evidence to argue that Moore could not have been the author. Major Henry Livingston, Jr., a New Yorker with Dutch and Scottish roots, is considered the chief candidate for authorship, if Moore did not write it. Livingston was distantly related to Moore's wife.